Readers looking for a modern day version of Latour's magnificent 1962 or 1971 should check out the sensational 1999 Latour. It is a big, concentrated offering, exhibiting a dense ruby/purple color, and a classic nose of minerals, black currants, leather, and vanilla. The wine is long, ripe, and medium-bodied, with high levels of sweet tannin. This surprisingly full, concentrated 1999 should be drinkable in 5-6 years; it will last for three decades. Drink: 2007 - 2032. Served blind at the chateau. 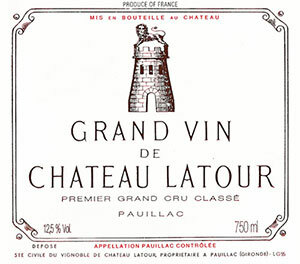 Compared to recent vintage the ’99 Latour is showing a little more maturity in colour than most. The nose is foursquare and masculine, the sous-bois element accentuated here and just missing the breeding of others. Lots of cedar aromas beginning to emerge. The palate is tannic, lifted with a slight graininess to the texture, a digestif quality just inflecting the finish that misses a little length. Fine. Tasted December 2009.